The Little Boy Blue Blanket Crochet Pattern is full of fun stitch work and color opportunities and was designed especially to compliment Lion Brand’s Heartland Yarn Collection (I’ve used it and it’s awesome … so extremely soft and the colors are beautiful!). We stitched this blanket up as a community awhile back but it’s not too late for you to make one too! You can scroll down to follow along with the pattern here or download a pdf of it for free from the Lion Brand website here. And of course I would love to see your finished blankets if you would like to share them in the Petals to Picots Facebook group. A total of 8 skeins Lion Brand’s Heartland worsted weight yarn (251 yd/230 m each). Colors shown in photo above are Olympic, Yellowstone, Acadia (2 skeins), Glacier Bay (2 skeins), Everglades, and Shenandoah. Resources and tutorials you may find helpful in following this pattern: Crochet Abbreviations, U.S. to U.K. Crochet Conversion Chart, How to Seamlessly Changes Colors, How to Crochet Standing Stitches. 11 dc + 6 rows = about 4 in. (10 cm). Center Granny Square = about 8 x 8 in. (20.5 x 20.5 cm). dc2tog (dc 2 sts together) (Yarn over, insert hook in next st and draw up a loop, yarn over and draw through 2 loops) twice, yarn over and draw through all 3 loops on hook – 1 st decreased. sc3tog (sc 3 sts together) (Insert hook in next st and draw up a loop) 3 times, yarn over and draw through all 4 loops on hook – 2 sts decreased. 1. Blanket is worked from the center out beg with Center Granny Square. Two V-Shaped Segments are worked over 2 side edges of Center Granny Square, then Corner Triangles are worked across the top edges of the V-Shaped Segments completing the center rectangle. 2. Borders are worked around the entire outer edge of the center rectangle. 3. 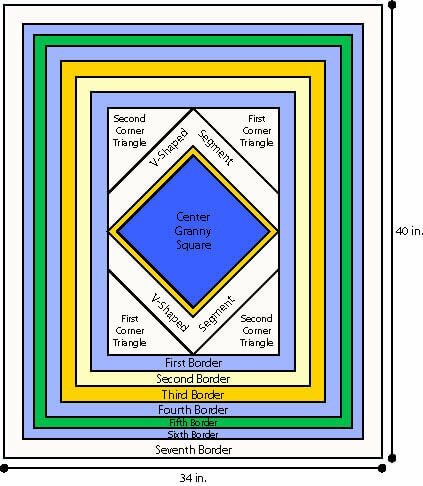 See Diagram for arrangement of Granny Square, V-Shaped Segments, Corner Triangles, and Borders. 4. To change color, work last st of old color to last yarn over. Yarn over with new color and draw through all loops on hook to complete the st. Proceed with new color. Fasten off old color. With A, ch 4, sl st in first ch to form a ring. Rnd 1 (RS): Ch 5 (counts as dc, ch 2), (3 dc in ring, ch 2) 3 times, 2 dc in ring; join with sl st in 3rd ch of beg ch – 12 dc (four 3-dc groups) and 4 ch-2 sps. Rnd 2: Sl st in first ch-2 sp, ch 7 (counts as dc, ch 4 in this rnd and in all following rnds), 2 dc in same ch-2 sp, dc in next 3 dc, *(2 dc, ch 4, 2 dc) in next ch-2 sp (corner made), dc in next 3 dc; rep from * 2 more times, dc in first ch-2 sp again; join with sl st in 3rd ch of beg ch – 28 dc (four 7-dc groups) and 4 corner ch-4 sps. Rnds 3-5: Sl st in first ch-4 sp, ch 7, 2 dc in same ch-4 sp, dc in each dc to next ch-4 sp, *(2 dc, ch 4, 2 dc) in next ch-4 sp, dc in each dc to next ch-4 sp; rep from * 2 more times, dc in first ch-4 sp again; join with sl st in 3rd ch of beg ch – 76 dc (four 19-dc groups) and 4 corner ch-4 sps at the end of Rnd 5. Fasten off. Rnd 6: From RS, join B with sl st in any ch-4 sp, ch 7, 2 dc in same ch-4 sp, dc in each dc to next ch-4 sp, *(2 dc, ch 4, 2 dc) in next ch-4 sp, dc in each dc to next ch-4 sp; rep from * 2 more times, dc in first ch-4 sp again; join with sl st in 3rd ch of beg ch – 92 dc (four 23-dc groups) and 4 corner ch-4 sps. Fasten off. 1. Each V-Shaped Segment is worked back and forth in rows over 2 side edges of the Center Granny Square. 2. All rows are worked from the RS. Cut yarn at the end of each row then rejoin it in indicated st to beg next row. Row 1 (RS): From RS, join C with sl st in first dc following any corner ch-4 sp, ch 3 (counts as first dc in this row and in all following rows), dc in each dc to next corner ch-4 sp, (2 dc, ch 4, 2 dc) in corner ch-4 sp, dc in each dc to next corner ch-4 sp. Rows 2-4: From RS, join C with sl st in 2nd st of previous row, ch 3, dc2tog, dc in each dc to next corner ch-4 sp, (2 dc, ch 4, 2 dc) in corner ch-4 sp, dc in each dc to 3 sts before next corner ch-4 sp, dc2tog; leave last st unworked. Fasten off.Rep V-Shaped Segment over remaining 2 side edges of Center Granny Square. Row 1 (RS): From RS, join C with sl st in 2nd st of last row of one V-Shaped Segment, ch 3, dc2tog, dc in each dc to 2 sts before corner ch-4 sp, dc2tog – 22 dc. Fasten off. Row 2: From RS, join C with sl st in 2nd st of previous row, ch 3, dc2tog, dc in each dc to last 2 sts of previous row, dc2tog – 19 dc. Rows 3-7: Rep Row 2 five times – 4 dc at the end of Row 7. Do not fasten off at the end of Row 7. Row 8 (WS): Ch 1, turn, sk first st, sc3tog. Fasten off. Row 1 (RS): From RS, join C with sl st in first dc following ch-4 sp at end of First Corner Triangle, ch 3, dc2tog, dc in each dc to last 3 sts of V-Shaped Segment, dc2tog; leave last st unworked – 22 dc. Fasten off. Row 2: From RS, join C with sl st in first st of previous row, ch 3, dc2tog, dc in each dc to last 3 sts of previous row, dc2tog; leave last st unworked – 19 dc. Fasten off. Rep First and Second Corner Triangle over remaining V-Shaped Segment. Do not fasten off after completing Second Corner Triangle. Edging Rnd: Turn piece to RS and rotate to work across long edge. Ch 1, *work 23 sc evenly spaced across side edge to Center Square, sc in st before ch-4 sp, 2 sc in ch-4 sp, sc in next st after ch-4 sp, then work 23 sc evenly spaced across remaining edge to next corner, ch 3 for corner, work 16 sc evenly spaced across next side edge to ch-4 sp, 2 sc in ch-4 sp, work 16 sc evenly spaced across remaining edge to next corner, ch 3 for corner; rep from * once more; join with sl st in first sc – 168 sc (50 sc across each long edge and 34 sc across each short edge) and 4 corner ch-3 sps. Fasten off. Rnd 1 (RS): From RS, join D in first sc following any corner ch-3 sp, ch 3, *dc in each sc to next corner ch-3 sp, (2 dc, ch 4, 2 dc) in corner ch-3 sp; rep from * 3 more times; join with sl st in top of beg ch – 184 dc and 4 corner ch-4 sps. Rnd 2: Ch 3, *dc in each dc to next corner ch-4 sp, (2 dc, ch 4, 2 dc) in corner ch-4 sp; rep from * 3 more times, dc in each dc to end of rnd; join with sl st in top of beg ch – 200 dc and 4 corner ch-4 sps. Rnd 3: Rep Rnd 2 – 216 dc and 4 corner ch-4 sps. Fasten off. Rnd 1 (RS): From RS, join E with sc in first dc following any corner ch-4 sp to work across one long side edge, *ch 3, sk next 2 sts, sc in next st; rep from * to last st before corner ch-4 sp, sk last st, ***(sc, ch 4, sc) in corner ch-4 sp, sc in next st, **ch 3, sk next 2 sts, sc in next st; rep from ** to next corner ch-4 sp; rep from *** 2 more times, (sc, ch 4, sc) in last corner ch-4 sp; join with sl st in first sc – 70 ch-3 sps (20 ch-3 sps across each long edge and 15 ch-3 sps across each short edge) and 4 corner ch-4 sps. Fasten off. Rnd 2: From RS, join F with sl st in first ch-3 sp following any corner ch-4 sp, ch 3 (counts as first dc), 2 dc in same ch-3 sp, *3 dc in each ch-3 sp to next corner ch-4 sp, (3 dc, ch 4, 3 dc) in corner ch-4 sp; rep from * around; join with sl st in top of beg ch. Fasten off. Rnd 3: From RS, join E with sc in first sp between 3-dc groups following any corner ch-4 sp, *(ch 3, sc in next sp between 3-dc groups) to corner ch-4 sp, ch 3, (sc, ch 4, sc) in corner ch-4 sp, ch 3; rep from * around, join with sl st in first sc – 78 ch-3 sps (22 ch-3 sps across each long edge and 17 ch-3 sps across each short edge) and 4 corner ch-4 sps. Fasten off. Rnds 4 and 5: Rep Rnds 2 and 3 – 86 ch-3 sps (24 ch-3 sps across each long edge and 19 ch-3 sps across each short edge) and 4 corner ch-4 sps at the end of Rnd 5. Rnd 1 (RS): From RS, join B with sc in any ch-3 sp, 2 sc in same ch-3 sp, 3 sc in each ch-3 sp around, working (2 sc, ch 4, 2 sc) in each corner ch-4 sp; join with sl st in first sc – 274 sc and 4 corner ch-4 sps. Rnds 2 and 3: Ch 3, dc in each sc around, working (2 dc, ch 4, 2 dc) in each corner ch-4 sp; join with sl st in top of beg ch – 306 dc and 4 corner ch-4 sps at the end of Rnd 3. Fasten off. Rnd 1 (RS): From RS join A with sc in first dc following any corner ch-4 sp to work across one long side edge, *ch 3, sk next 2 sts, sc in next st; rep from * to last 2 sts before corner ch-4 sp, ch 3, sk 1 st, sc in next st, ***(sc, ch 4, sc) in corner ch-4 sp, sc in next st, **ch 3, sk next 2 sts, sc in next st; rep from ** to last 2 sts before next corner ch-4 sp, ch 3, sk 1 st, sc in next st; rep from *** 2 more times, (sc, ch 4, sc) in last corner ch-4 sp; join with sl st in first sc – 102 ch-3 sps (28 ch-3 sps across each long edge and 23 ch-3 sps across each short edge) and 4 corner ch-4 sps. Fasten off. Work Rnds 2-4 of Second Border, working 1 rnd each with D, A, and D.
Work Rnds 3-5 of Second Border, working 1 rnd each with F, E, and F.
Work Rnds 2 and 3 of Second Border, working 1 rnd each with D and A. Note: Corner blocks are worked as part of the border. Work over C with new color. Rnd 1 (RS): From RS, join C with sc in any ch-3 sp, 2 sc in same ch-3 sp; *with C, work 3 sc in each ch-3 sp to next corner ch-4 sp; change to B and working over C, work (2 sc, ch 4, 2 sc) in corner ch-4 sp, change to C, fasten off B. With C, work 3 sc in each ch-3 sp to next corner ch-4 sp; change to D and working over C, work (2 sc, ch 4, 2 sc) in corner ch-4 sp; change to C, fasten off D. With C; rep from * once more, work 3 sc in each ch-3 sp to end of rnd; join with sl st in first sc. Rnds 2-4: With C, ch 3, *dc in each st to next B-colored section; change to B and working over C, dc in each st to next corner ch-4 sp, (2 dc, ch 4, 2 dc) in corner ch-4 sp, dc in each st to next C-colored section; change to C, fasten off B. With C, dc in each st to next D-colored section; change to D and working over C, dc in each st to next corner ch-4 sp, (2 dc, ch 4, 2 dc) in corner ch-4 sp, dc in each st to next C-colored section, change to C, fasten off D. With C; rep from * once more, dc in each st to end of rnd; join with sl st in first sc. Rnd 5 (WS): Ch 1, turn, sl st in each st and ch around, changing color to match color of sts in previous rnd. Fasten off. Weave in ends. If you wish to block your Blanket, lay Blanket onto a flat, waterproof surface. Lay a damp towel on finished Blanket for 30 minutes. Remove towel and allow Blanket to air dry. 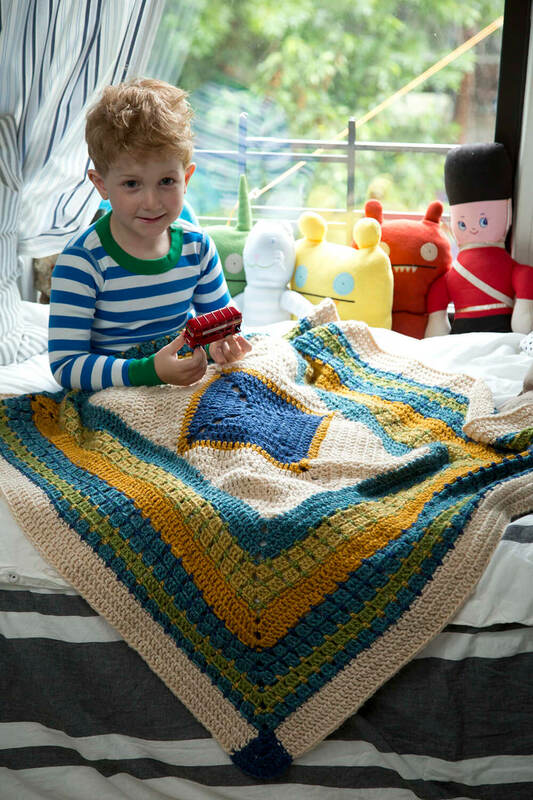 The Little Boy Blue Blanket (Pattern Number: L20643) was designed especially to compliment Lion Brand’s Heartland Yarn Collection. Crochet along approved and pattern reprinted with permission from Lion Brand Yarn. I’m so excited to get started on this afghan! This yarn and these colors are absolutely gorgeous!! I saw the pattern on Lion Brand’s website but there is a correction to it. Do your instructions reflect the corrections? Just wanted to make sure. Thanks for the CAL! Where do I find the pattern to crochet along with? Oh how lovely, I will be crocheting along, come on Monday. Never mind. I will just try to create my own pattern, I have done in many times before, but the picture makes it harder to count the stitches. I am already busy on Monday’s . I have to come back every other Monday to get the entire afghan pattern. It doesn’t look that hard, Why can’t I just purchase the pattern. I am not new to crochet, I just would like the pattern. Is there a way to just get the pattern? Where you are commenting is my site. The pattern is available for free on Lion Brands website. I broke it up into sections for the crochet along so those who want to be a part of it can all work together. Hi Karen 🙂 We are going to be working through this pattern together as part of a crochet along. I will post the parts every other Monday so we can all work together. Be sure to check back Monday for the first part of the pattern. Thanks! I am going shopping this weekend and picking up the yarn. I need a stress reliever and haven’t crocheted in a while. How will I get the pattern? On facebook? The patterns will be posted here on my website every other Monday, starting this next one. I will also give a shout out on Facebook to let everyone know when they are up. I can’t seem to find the pattern. Can you help me? Thanks! Hi Deb 🙂 The first part of the pattern will be up on Monday. I want to join in and I can’t wait to start. But first i must order some new yarn. I think I can’t order the Lion Brand yarn in germany so I will use another yarn. Is that a problem? I am a beginner crocheter but I might give this a try if I can decipher the directions.